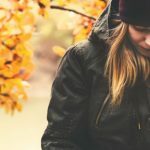 In today’s world, being online and reading blogs (like this one) can be done in a variety of different ways and in countless locations. Technology has reached a point where, aside from a wifi connection, there doesn’t have to be much similarity at all in how we take in information. There is one thing, however, that anybody reading this blog, whether it be now or in the future, has in common; we are all breathing. On average, each of takes 16 breaths per minute, which equates to 23,040 breaths per day or 8,409,600 breaths per year! Breathing is one of the most important aspects of our survival. We can live for a few weeks without food and for a few days without water. But we have mere minutes without the exchange of oxygen and carbon dioxide. In fact, it only takes 3 minutes of oxygen deprivation for brain damage to occur. With breathing being as important as it is, you would think that the body would have many different redundancies and safeguards to ensure sufficient air exchange occurs; and you would be right. In this blog post I am going to go over the three different phases of respiration we go through, depending on our level of exertion. I am also going to cover some things that could impede on those muscle groups and the significant influence those problems can have on our respiratory system. As always, if any of what you read relates to you, please contact us to set up a time to come in and discuss what’s going on. Sedentary breathing refers to when you are not exerting yourself at all, most likely sitting or lying down. When breathing without exertion, there is primarily one muscle that controls respiration; the diaphragm. Your diaphragm is a large flat muscle that sits just below your lungs at the bottom of your rib cage. When we want to take a breath in our body will involuntarily contract this muscle which opens up space below our lungs. This space creates a negative pressure which allows for our lungs to expand naturally. When we want to exhale we simply stop contracting the diaphragm and that compresses our lungs back up into our chest, forcing air out of them and out of your mouth and nose. It is widely believed that our lungs primarily expand outward towards our ribs when we breath but our lungs actually expand downwards into our torso. There is virtually no effort made on our part in this process. The expansion and contraction of our lungs during sedentary breathing is almost exclusively a result of changing pressure gradients in our torso. Labored breathing is a step above sedentary breathing in regards to intensity. This type of breathing usually occurs when we exert ourselves to a slight degree. Examples of this exertion include walking up a large flight of stairs or going for a brisk walk. 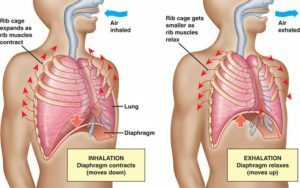 During labored breathing our diaphragm is still working like it did during sedentary breathing but now there are more muscles involved in increasing our respiration. Between our ribs are a bunch of small muscles called intercostal muscles. These muscles run obliquely between our ribs and, when contracted, force our ribs to expand outwards from each other. This is best seen if you take a deep breath and notice how your chest and even your back will expand. This expansion of the ribs is what most people associate with breathing. In labored breathing, we begin to make a physical effort to expand our ribs to allow for more space for our lungs to expand and exchange air. However, when we exhale, all we are doing is relaxing the rib muscles and diaphragm and allow the pressure gradients to push the air from our lungs and out our mouth and nose. Maximal exertion breathing is our most intensive attempt at respiration and is typically only done after we have exerted ourselves to a very high degree. Examples of this exertion would be running a race as fast as we can, doing circuit training at a high intensity, or running sprints. 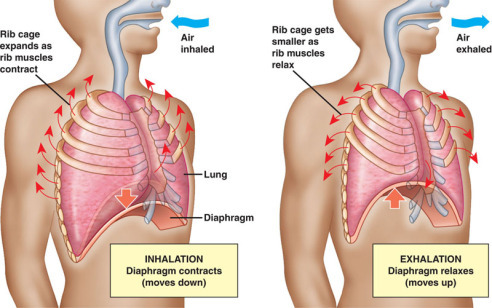 In this phase of respiration our diaphragm and intercostal muscles are still working hard but now muscles in your chest and upper back are recruited to help with increasing lung capacity. The most notable of these muscles are your pectoralis major and minor (“pecs” for short) muscles. These muscles start at the front of your rib cage and end at your shoulders. Normally, these muscles are used in lifting objects with your arms but when you plant your hands and lock out your arms they instead will help with breathing. At the end of a race or an intense cardio event you will notice a lot of people will put their hands on their thighs (shown below), hips, or head until they catch their breath. We do this in order to lock out our arms and get our pec muscles to help with respiration and increase our air exchange rate. With all of these muscle groups involved in breathing, there are a lot of issues that can come about that may hinder their effectiveness. 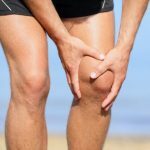 One of the main issues is a lack of mobility within the joints that these muscles connect to. If your ribs or shoulders aren’t moving like they should, you won’t be able to get the rib expansion you need for optimal air exchange. Similarly, if the joints in the spine that are attached to the ribs aren’t moving like they should, you won’t get optimal air exchange either. Spinal joint, ribs, and shoulder joints are all very common sites for joint dysfunction and should be treated before the problems get worse. 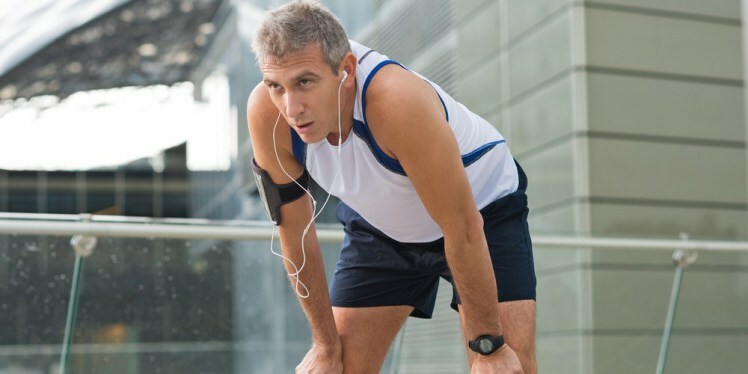 If you have noticed that you have trouble taking deep breaths or your breathing feels “off” when working out, you may be having joint dysfunction. Here at Exuberance Chiropractic & Wellness Center we work with dysfunction of the spine, ribs, and shoulders everyday and would love to schedule a consultation with you to determine what the cause of your problem is.